Geek Lit Etc. : Imagine the air quality if we still used coal in cities today! Wink has very little to complain about. After having lived on the streets for most of her childhood, she's been adopted into the home of a Knight of the Round Table along with the children she used to be on the streets with. Given the protection of her new family, as well as a pack of brothers, she has been able to pursue her talent with all things mechanical. Even if the Royal Society dismisses her research into saving the coal-smoke-filled air and lungs of London by converting to steam-power, at least she has the opportunity to speak before them, as well as a family and friends that will jump to her defense when the hecklers cross the line from dismissive to downright obscene. It's the friends, though, that are at the root of her dilemma. A close friend, Connor, has set his heart on marrying her. Wink knows that an outspoken girl in her twenties is hardly a good catch, and she should be grateful that such a man would be interested. It wouldn't be a bad match; at least it would be founded on friendship and a mutual respect. But Wink sees Connor strictly as a friend. Unlike Liam, a police inspector, werewolf and confirmed bachelor. As much as Liam cares for Wink, he'd never consent to marry her. His father, also a werewolf, had terrible control of his temper. His first marriage wasn't a good match, and Liam watched his mother wither under his father's brutality, eventually dying in childbirth. Having sworn never to subject one he loves to his own hot temper, he's firmly decided to stay single. And the best way to do that would be to see Wink married off to Connor as soon as possible. Their romance, however, must take a back seat to Liam's duties as an inspector. There's been some rumblings as of late about getting rid of the practice of primogeniture. The idea that only the firstborn son can inherit titles and land, combined with l lowering of infant mortality, has created a large population of 'spare' sons, who are rather discontent with their lot in life. There's also been a rash of disappearances in the poorer sections of London. Normally, the police wouldn't get involved with a handful of sailors and carnival workers going missing; some men are still Shanghai'd from the docks, and drunkards do fall into the Thames on their own. One of the missing, though, is the dear soon of a lady that helped Wink in her harder times, and Wink has asked Liam to look into the situation as a personal favor. The description of a man made of metal who has been seen in the area has their interest piqued, too. There's plenty more to this story than the love triangle that makes it a romance. The investigations, Wink's backstory, and the family that these former street kids have created with the Hadrians keeps the plot moving at quite a clip. 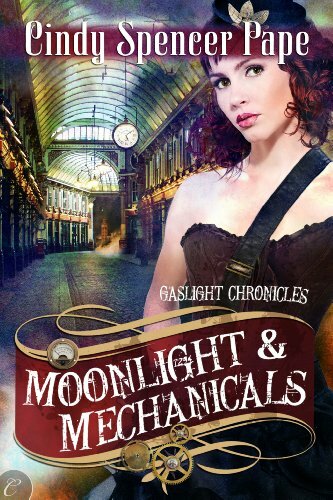 All of this, wrapped in the backdrop of Steampunk London makes Moonlight & Mechanicals a quick, diverting read. Highs: The minor characters, from Wink's younger sister Nell to the members of the Knights of the Round Table are delightful and deserve their own stories as well. Lows: Being the fourth in the series, it's hard to catch on to how the universe works, as there's little recap. Verdict: A fun, fast-paced read, but it may be best to begin at the beginning.